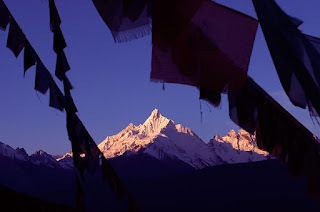 One of Life's most awesomest experiences - watching dawn light falling onto the 13 peaks of Meili Snow Mountains. The Meili Snow Mountains (梅里雪山 ), or the Prince Mountains is a range of mountains situated in the northeast region of Diqing county in Yunnan China. 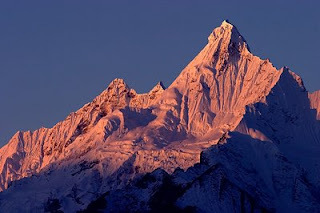 It's main peak, Kawa Karpo, is one of the holiest mountains of Tibetan Buddhism. Like Mt Kailash, thousands of pilgrims would undergo a kora (circumambulation) round the mountain. 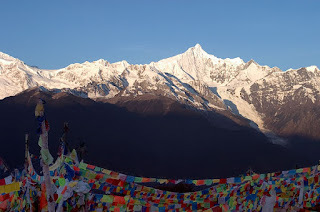 While "only" 6740m, Kawa Karpo has not been ascended. Flanking Kawa Karpo on both sides, there are 12 other snow capped peaks. Every morning, when the sky is clear, the rising sun's rays will fall onto these peaks, bringing the mountains on fire. The prime location to view this spectacular phenomena is a village/town of FeiLaiSi. Transport can be arranged in the town of Deqin, and guesthouses are plenty in FeiLaiSi. It is said that clear days are a rarity here, so I stayed 2 nights to maximise the chances of viewing. And I got 2 days of clear weather! for those who are interested, can attempt to do the 2 days or 3 days trek to meili snow mountains. can visit 雨崩村 and 神瀑, which literally mean the waterfall for the gods, supposedly a holy place for the tibetans. must trek to meili and attempt the road trip betw 飞来寺 and 西当温泉, the starting point of the trek to better appreciate the beauty of meili snow mountains. and pls do avoid visiting meili snow mountains in aug. you have to be very very lucky to see the mountains. Yubeng was well received by many pple, but unfortunately, I didn't get to do it. I didn't realise I was that lucky till I came back and heard many pple commenting that the mountains are shroulded in clouds most of the time! hi!! u take great pictures!!! i was at feilaisi in mid july, did the trek around yubeng. the scenery around meili snow mountain is so great with the good weather; i'm really blessed to have seen the sunrise from feilaisi on 2 morning and also great scenery along the trek!! Glad that you like the photos. You've seen the real thing, so these pics prob don't do it justice. And you also saw the sunrise on 2 mornings like me!